"This is an easy to prepare slow cooker recipe that will have them asking for more. Try serving over potatoes, rice, or even noodles. You may also try adding green bell pepper for variety. It's also great using venison instead of beef." 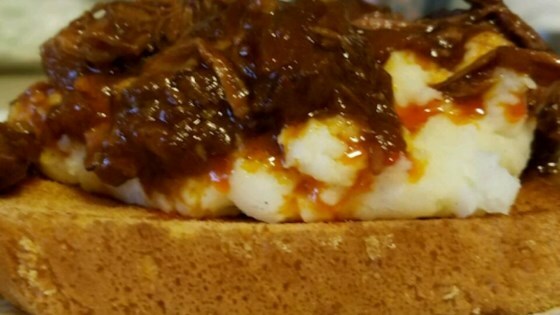 Place the beef, onion, tomato paste, water, sloppy Joe seasoning mix and vinegar in a slow cooker. Cook on low setting for 10 hours OR on high setting for 5 hours. Did you know Allrecipes is home to tons of slow cooker recipes? Click here to visit our complete collection. After reading reviews of being bland, I added chili powder. I also threw in a can of kidney beans and diced tomatoes. Was awesome over egg noodles. This was very easy to prepare. It tasted good, however, I think the next time I'll add a little more spice (peppers) as this seemed just a little bland. This was an easy dish but my family wasn't fond of the flavor. A bit blan for my husbands taste, but the kids and I liked it! Great over egg noodles! This was an excellent pot roast with the added spices. My whole family loved it and it was so easy! Very tasty. Great over rice. Add a little extra garlic and it's a wonderful red pasta sauce. This is getting 4 stars from my family. We did add garlic and chili pepper but I think it needed something eles (citrus or something).